TO SAM'S STEREOSCOPIC PAGE ! This is my personal site to show off some of my home-made Stereo Cameras and Equipment, as well as a collection of my images. What is a stereo camera? 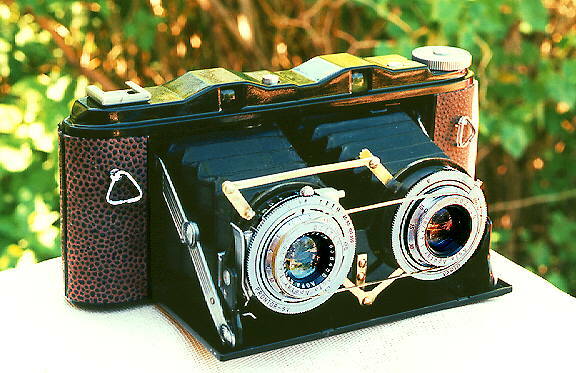 It's a camera that takes three-dimensional or Stereoscopic photographs. 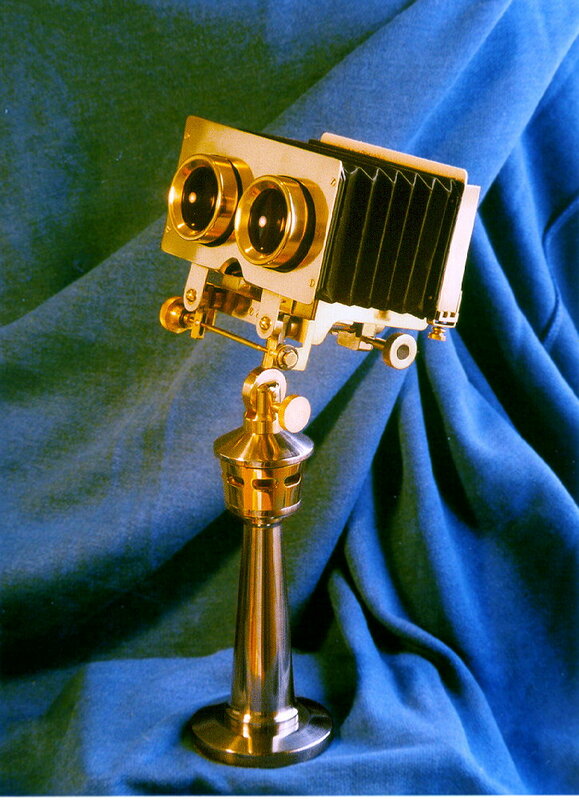 Why make a stereo camera? Most stereo cameras around today are either antiquated, poor quality or extremely expensive. Custom-made or modified rigs can be relatively inexpensive, and allow you to personalize equipment to suit your individual needs. Unfortunately I do not have the time these days to explain how to make these, but hopefully my pages will at least inspire others to try their own creations. This is a more practical approach to the famous Macro Realist which sells for ridiculous amounts of money for what it is. I get standard Realist format pairs with this, and can take subjects from 6" to 20" away. 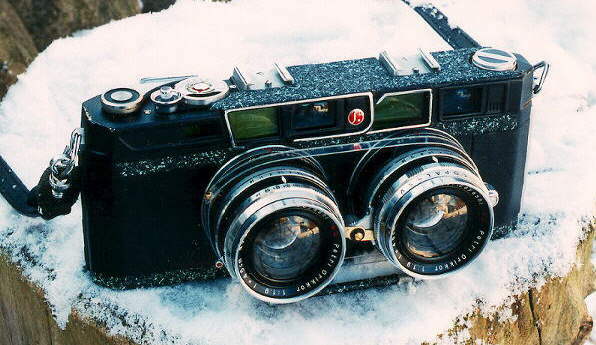 Another merging using relatively low-cost cameras, namely Agfa Isolettes. Compact medium format stereo. This was a stereo camera in a hurry. I needed horizontal format stereo during a stay in Asia a few years back, so I cooked this up using russian Lomos I'd picked up in Vietnam for a few bucks. With little more than some crazy glue and a hack saw blade I threw this together, and managed to get some pretty good stereo shots of China and Burma with it! A very economical and simple project using 2 Ricohflexes. 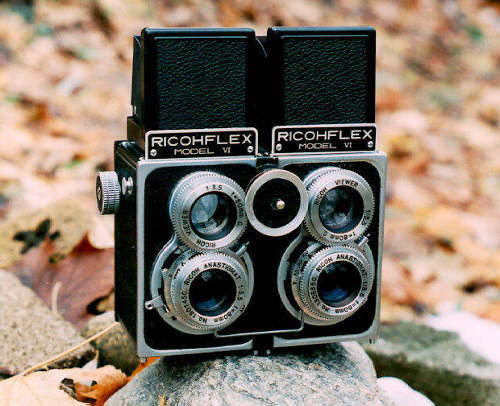 It uses two rolls of 120 film. The shutters are merged into one, the focus is coupled, but the apertures are still independant. Not wanting to be known for just my salvaging of old cameras, I made this viewer completely from scratch. All brass parts were turned, milled and machined from brass stock.The column is solid steel and brass, and made to look like the Calgary Tower, a local landmark. The bellows are also handmade. 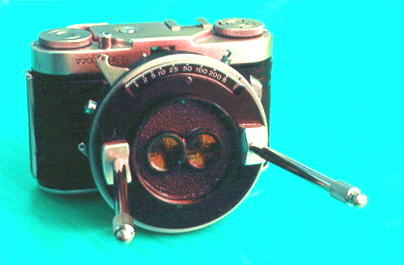 As for features, the viewer has focus, interocular and tilt adjustments. The slide carrier adjusts for different formats from medium format down to Realist format. 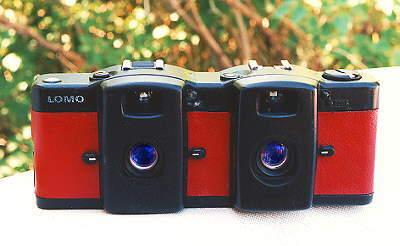 The standard lenses are 40x84 achromats, with supplementry lenses for viewing 35mm images. The bellows can be removed for viewing prints, and tranparencies can be viewed with natural, incendescent and flourescant light depending on attachment. I may be producing a similar viewer for commercial use in the near future. Are any of these cameras for sale? Although I am always happy to talk to other 3d buffs, please not not ask me for step-by-step instructions on how to make any of these. General questions or tips on finding supplies are welcomed. If you do become inspired to try your own projects, please do so at your own risk. It can be a very rewarding hobby, but it can also be one with a lot of sweat and frustration! Want to learn more ? Here are some other LINKS to popular 3-d photo sights as well as suppliers of cameras and supplies. If your have anything on this list, please let me know.